Brush and wash crabs. Cook 15 min with carrot, parsley, thyme and onion piqué of cloves. Then peel the flesh and reserve. Finely chop the bacon, garlic, shallots, chives, pepper and a few sprigs of parsley and sauté the mixture in a casserole. Add the crab meat and brown. Add the bread crumbs soaked in milk and mixed. Drizzle with lime juice. You can also flavor with a little white wine or rum. 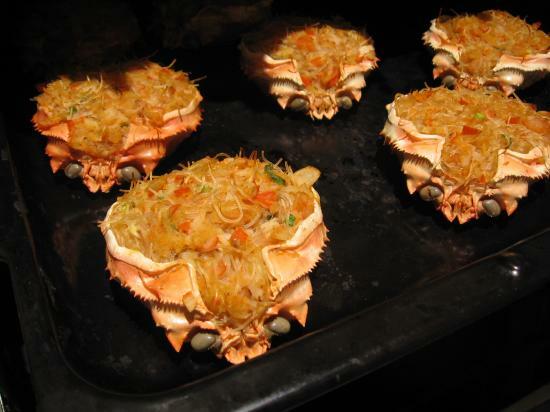 Fill the shells of crabs with this stuffing, sprinkle with breadcrumbs and put in the oven 5-10 minutes.